A large number of Pakistan Muslim League-Nawaz (PML-N) party supporters, including women workers, gathered outside the Haj Terminal in Lahore to welcome them. LAHORE: Deposed Pakistan prime minister Nawaz Sharif, his daughter and son-in-law were brought to their home turf, Lahore, in a special plane after their release from prison in Islamabad Wednesday evening, hours after the Islamabad High Court suspended their sentences in a major corruption case that jeopardised their political career. Subsequently, the Sharif family was escorted to their Jati Umra residence located in the outskirts of Lahore. While they were being escorted, the party supporters showered Sharif's car with rose petals and chanted slogans "dekho dekho kon aya, sher aya, sher aya (see who has come, a lion has come)". Some of the supporters also kissed his car saying, "You are innocent, we love you." 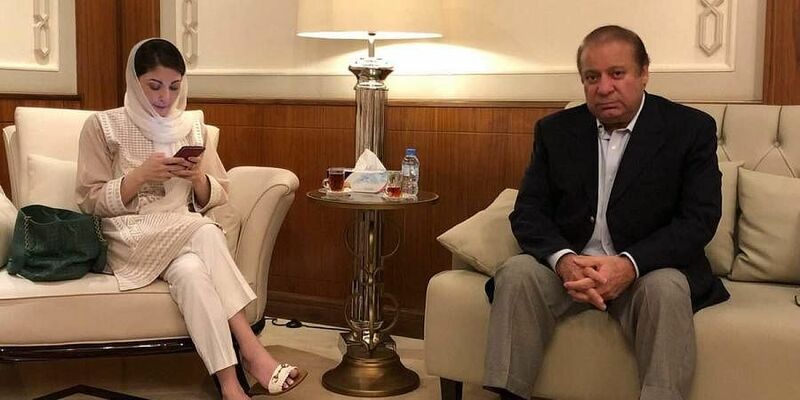 A large number of PML-N workers were also present at Jati Umra to greet the former prime minister, his daughter Maryam Nawaz and son-in-law Mohammad Safdar. The road leading to Jati Umra was lit up as workers queued up there to receive their leaders. "I have come here soon after I heard the release of my leader (Sharif) from the Adiala jail. I am very happy to have him among us," Hasan Ali, a PML-N worker, said. He said no corruption charge has been proved against his leader and he was put behind the bar to give Imran Khan an "open field" to form the government. The PML-N workers distributed sweets and also offered thanksgiving prayer at Jati Umra. "We will continue celebrating the release of our leader for coming days," PML-N leader Imran Nazir said. PML-N president Shahbaz Sharif said the court's decision has vindicated his elder brother. "Today truth prevailed and my brother has been vindicated," he added.